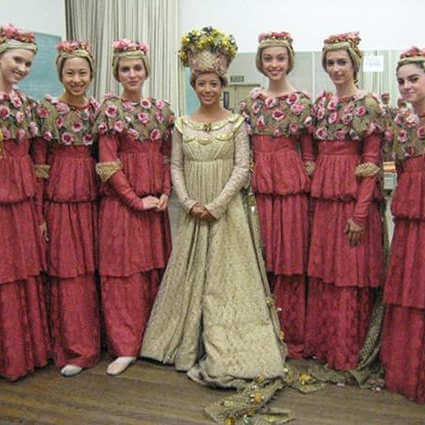 Mad Wedding Dresses . . .
- for a woman one of the single most important things is that her wedding dress is perfect. Every bride wants to be original and stand out from the crowd however, the following brides-to-be turned heads for all the wrong reasons when they walked down the aisle. 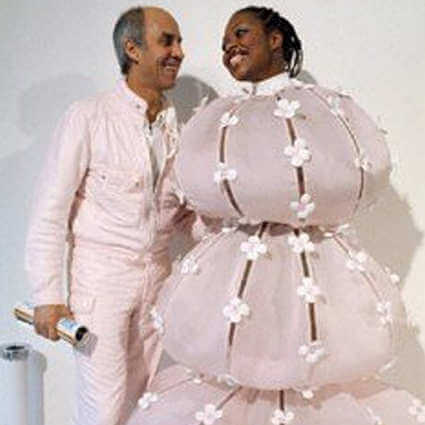 From gowns made out of toilet roll to dresses that leave very little to the imagination, it is hard to believe these individuals thought these wedding dress train wrecks were ever a good idea. Just wait until you see number 10 - it left us scarred for life ! 1. Octobride . . .
. . . 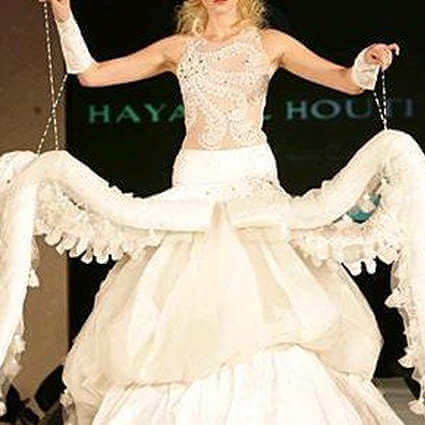 When you think of the perfect wedding dress, never does it have tentacles attached. We really hope this lady looked back on this fashion disaster and regretted her choice. 2. Princess Puffball . . .
. . . There's puffy and then there is this monstrosity. She can't even fit in the carriage for goodness sake. Plus, in her attempts to channel her favourite Disney princess, she has ended up with a giant puffball that looks like an oversized batch of cotton candy. 3. Southern Eyesore . . .
there is no denying the brides choice of colour for her gown is enough to make her husband-to-be run for the hills. 4. Diaper Disaster . . . Here we have a very confusing dress made from, yes you guessed it - diapers. Eww. 5. Toilet Roll Terror . . .
. . . 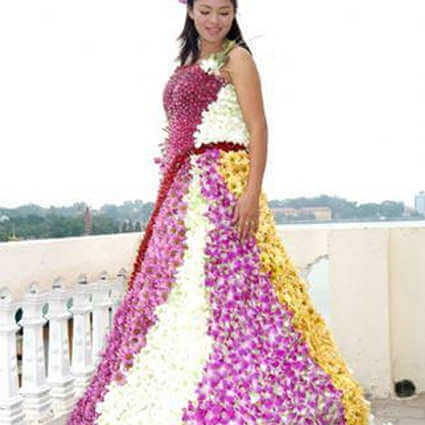 Staying with the toilet theme, here we have a dress made entirely from toilet roll. 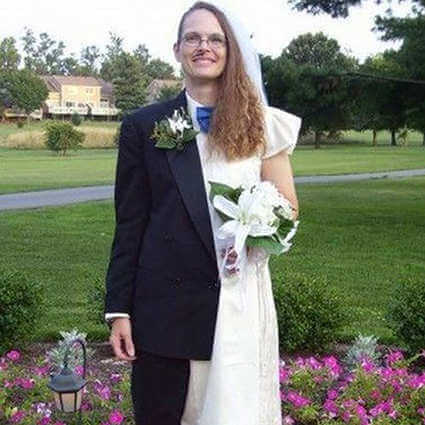 We are all for a low budget wedding, but surely this is a step too far ? However, we have to admit, it doesn't look completely horrific. 6. 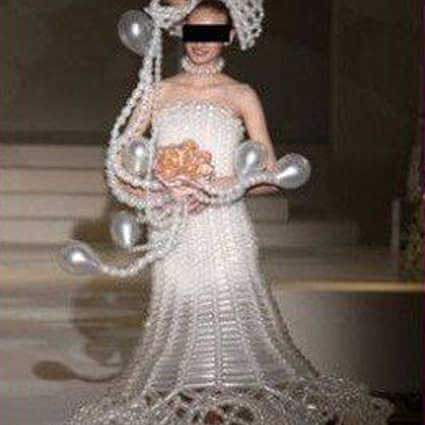 Protection First . . .
. . . No, you aren't imagining this, someone out there actually walked down the aisle in a dress made entirely from condoms. At least they will be prepared come their wedding night. 7. Too Much Information . . .
. . . This bride was definitely not afraid to show off her assets. if she does settle for this dress. 8. All Out Naked . . .
. . . If you thought the previous dress was risque then you will be even more baffled by this completely non-existent one. 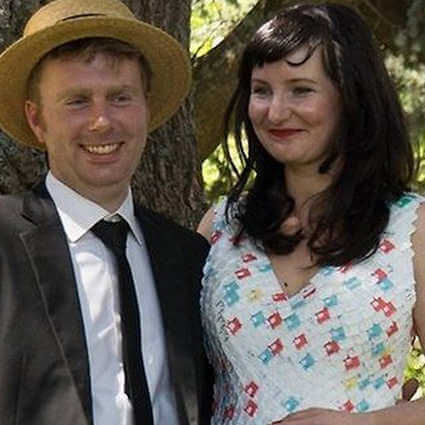 These nudists were adamant they would bare their "true selves" whilst tying the knot. 9. When You Can't Find Your Other Half . . .
10. (Not So) Pretty In Pink . . .
. . . Not only is her dress not white, she thought it was a good idea to plaster it with sparkly love hearts. The only way to salvage this mess would be to burn it and start again. 11. Talk About O.T.T. . . .
. . . It might be white but that is the only thing conventional about this humongous dress. 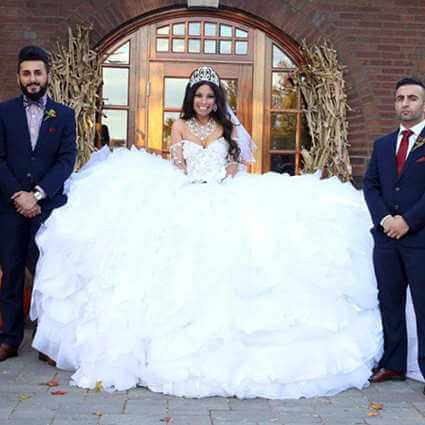 She said the bigger the better but we can't help but disagree after looking at this ridiculous dress. 12. Serious Sports Fan . . .
. . . We are all for supporting your favourite team, but this bride took her love for Man City a step too far with this one. 13. Nothing Left To The Imagination . . .
. . . We are totally in favour of the saying "If you've got it, flaunt it" but we didn't think this would encourage people to walk down the aisle practically naked. 14. Stay Classy . . .
All that flesh on show on the day when you are supposed to look the epitome of class and sophistication. 15. Head-To-Toe Horrendous . . .
. . . Worringly, this was designed by Yves Saint Laurent in 1965. Given the masterpieces that have been made by the fashion brand since, we will let this one disaster slide. 16. 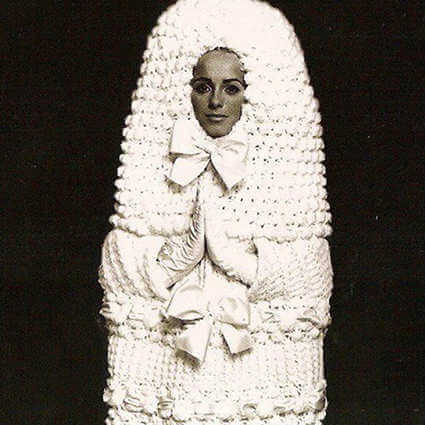 Wooly Wedding . . .
. . . 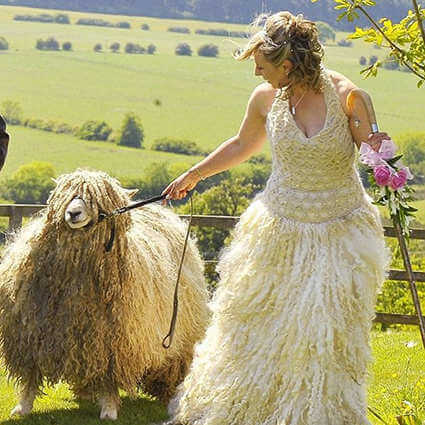 When a sheep farmer was due to tie the knot, she decided to have a dress made entirely from her favourite sheep wool. 17. Hanging Out . . .
. . . Yet another bride who is desperate to flaunt her assets for the world to see. We can only hope they stayed in place so as not to show them off even more. 18. Bread Tag Bride . . .
. . . What started off as a joke soon got out of hand. realised she loved it and wore it on her big day. 19. Reuse And Recycle . . .
. . . Yet another bride making the most of what she's got. But why? 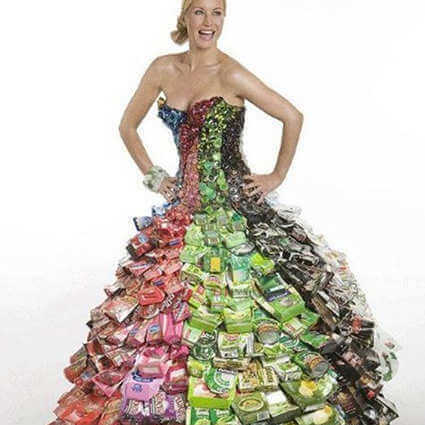 Recycling is a necessity in life, but that doesn't mean you have to wear it on your wedding day. 20. Balloon Dress . . .
. . . Getting creative led to this questionable dress being made. 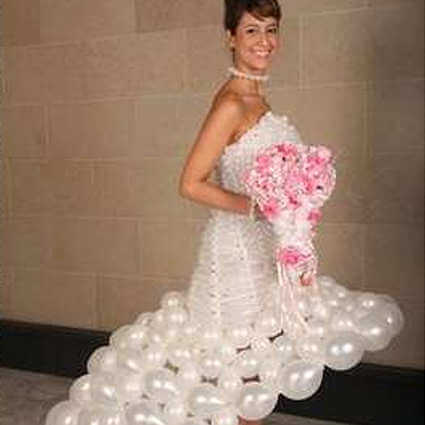 At least when it came to the afterparty she could pop all the balloons and transform it into a short party dress. 21. Ugly Bride Uglier Bridesmaids . . .
the bridesmaids are bad if not worse. 22. Flower Power Bride . . .
who wanted to make sure that she was by far the most glamorous woman at her wedding. 23. Flag Dress Fail . 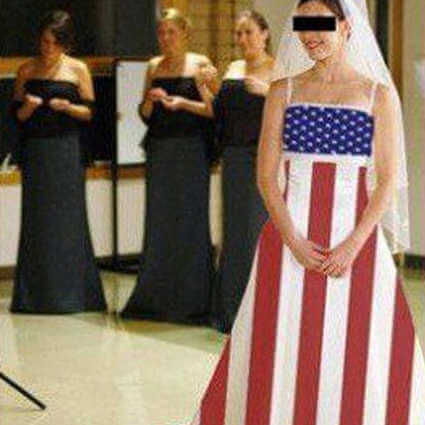 . .
but wearing a flag dress on your wedding day is just way too much. 24. Chandelier Dress . . .
25. Snowman Dress . 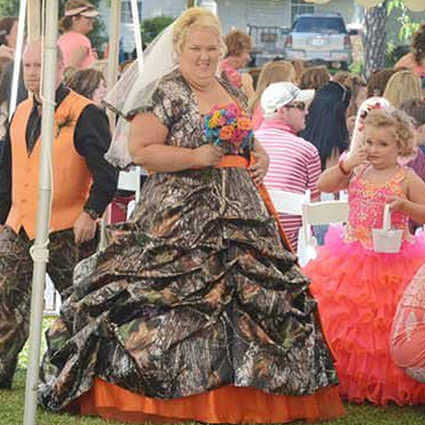 . .
not so much wedding dress inspiration.